Sauber's former test driver Giedo van der Garde has won his case against the team after a court backed his claim that he was promised a race seat. The ruling brings uncertainty to Sauber days before the start of the season-opening Australian Grand Prix. 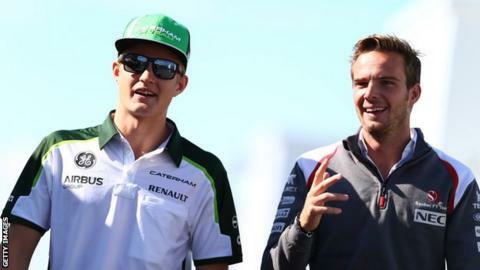 Van der Garde was not due to race, with Swede Marcus Ericsson and Brazilian Felipe Nasr the stated race drivers. But the Victoria Supreme Court has ruled Dutchman Van der Garde, 29, should drive in Melbourne. Sauber have launched an appeal, which is due to be heard later on Wednesday in Australia. Should that appeal fail, it is unclear whether Sauber will drop one of their current drivers, or race with Ericsson and Nasr and risk contempt of court. The team says letting Van der Garde race at such short notice - in a car designed for Ericsson or rookie Nasr - would be unsafe. Team principal Monisha Kaltenborn said: "What we cannot do is jeopardise the safety of our team, or any other driver on the track, by having an unprepared driver in a car that has now been tailored to two other assigned drivers. "We are disappointed with this decision and now need to take time to understand what it means and the impact it will have on the start of our season." Van der Garde's lawyers argued that in 2012, a Formula 1 driver was fitted with a seat just three days after being granted a drive by an emergency ruling. The driver himself has said he is ready to race and is the" fittest ever". "I've been training the last three months flat out. I still have a very good relation with the team, and I'm looking forward to racing this weekend," he said. The former Caterham driver said he was unconcerned by the prospect of displacing one of the current drivers from the race seat. "It's up to them what they are going to do, and up to the team. It's not my thing," he said. Van der Garde originally brought the case after he was dismissed from his role as a test driver, saying he had proof he had been offered a race seat. He took his case to a Swiss arbitration tribunal which ordered Sauber to keep him on the team - a decision which the Victoria court has now enforced. Free practice for the Australian Grand Prix begins on Friday, with qualifying and the race to follow over the weekend. "I think it indicates the desperate need that some teams are in where they find other drivers presumably who can bring in more money. "The funding that teams need these days is critical - it seems that Sauber have been prepared to disregard what they agreed in 2014 and take two other drivers who have taken a bigger budget to support the team. "This story sums up the state of Formula 1. After Mercedes, Red Bull and Ferrari, the teams have to struggle to find the money. The fundamental problem is that F1 is costing too much right now." John Watson was speaking on BBC World's Sport Today.